Feeling rather under the weather, and not up to writing much, so I’ll just post some pictures. I was walking along Chavchavadze Avenue the other day, the main thoroughfare through fashionable Vake, and came across a group of men either loading or unloading this car; there was a good deal of loud discussion and vigorous gesticulating, but not much action, from what I could tell in the few minutes that I was around. 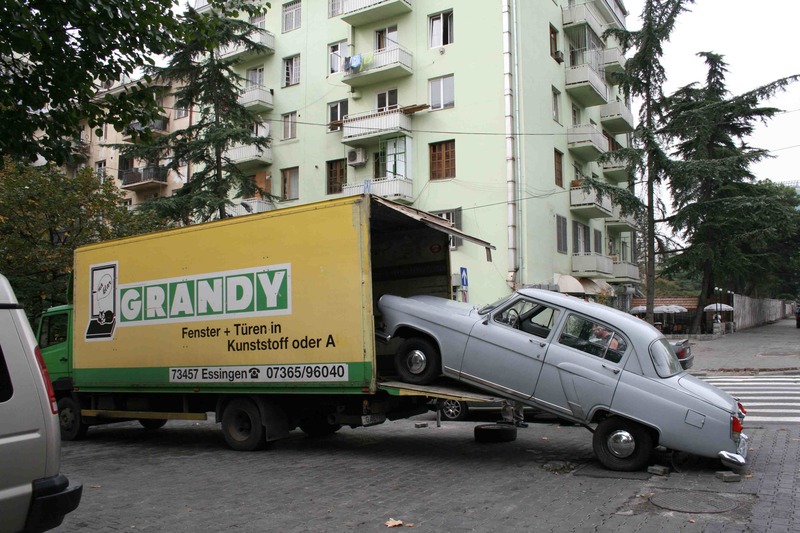 Curiously, the truck was obviously an old German one, and one sees this quite a lot around town: lots of hand-me-down vehicles, most of the German, but also some Dutch ones, and even an old Greek taxi. There are also a surprising number of Mercedes around, many of them late ’80’s models, and often, in the quieter residential areas, one sees small groups of young men standing around the engine of such cars, tinkering with the engine. 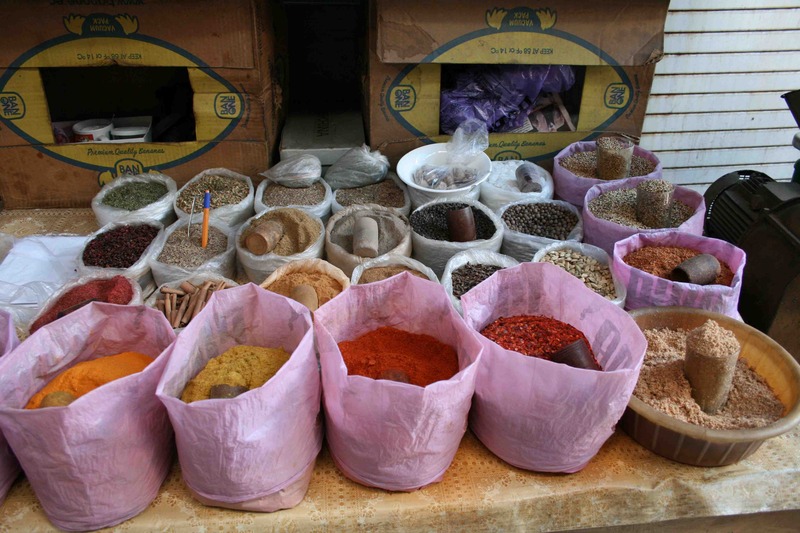 Thursday, I think it was, I went with Ian to the Vagzlis Moedani market, the one near the main railway station. 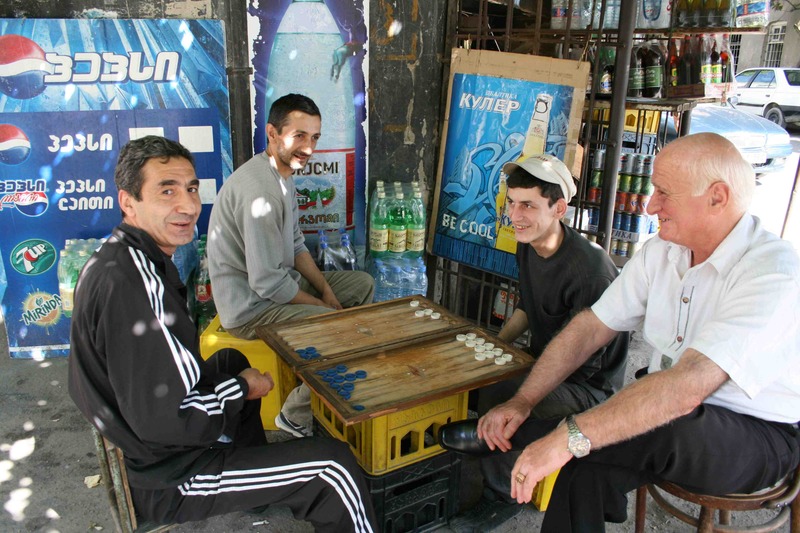 All over town one sees groups of men hunched over backgammon boards, perched on makeshift tables, and I thought I’d take a picture of them. With gestures towards my camera and towards them, I asked whether I could take a picture; the guy in the black shell suit shook his head scowling, wagging a finger at me and muttering “Ara ara ara” (“no”). So I smiled and shrugged and rejoined Ian. As I was walking away, he barked “Nationalitze?” or something similar, so I replied: “Italia!”, and his scowl broke into a grin and he waved me over, pointing to himself and his buddies in a gesture permitting me to take this picture. “Va bene! Come stai! Milano! Ronaldo!” he chuckled, and shook hands with me. Ian thought that they had assumed that I was American, and wouldn’t therefore include me in their hospitality, and thawed only when they understood that I wasn’t. Not sure if this was the case, or whether he just felt bad about dismissing me so brusquely; considering what I’ve seen of the Georgian character, I wouldn’t be surprised if this were true. Amazingly warm people. Some nice ladies I met while walking around Mtatsminda, behind Rustaveli. I was scouting out the areas in which I’d seen apartments advertised online, and was trying to find a certain street. They were sitting on a park bench chatting, and I stopped to ask where a certain street was; one of them–the blonde on the right–spoke a little English, and we fell into conversation. 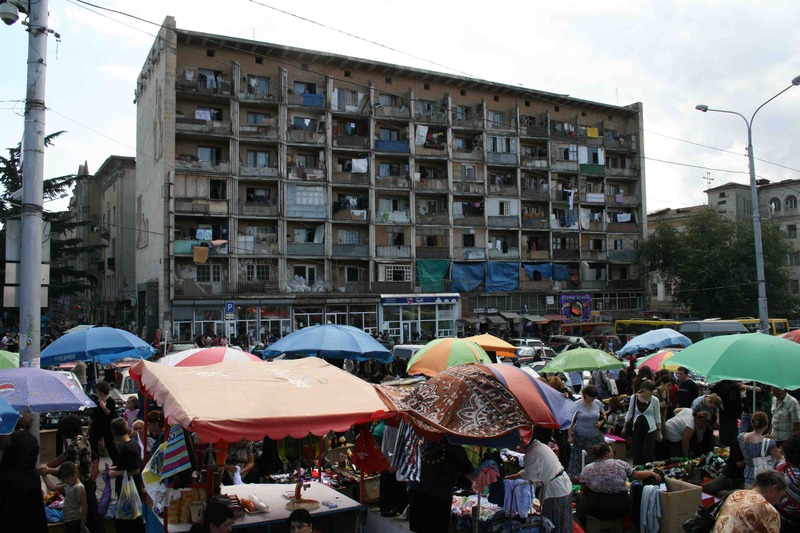 I told them that I had just arrived in Tbilisi, and was looking for apartments, etc. They immediately took charge: the lady on the left is apparently an estate agent, and she seemed keen on helping me out. We agreed to meet the next day, after she’d had a chance to check out the options. “You don’t pay large rent for foreigner!”, they affectionately admonished me. Apropos of my interest in music, and my intention to visit the opera once the season started, the older lady mentioned that she had married the son of Georgia’s most famous composer, the man after whom the opera is named, and who appears on the 2 GEL bill; I was suitably impressed and said it’d be great if she could find me a piano teacher. “I will be your teacher!”, she exclaimed. Should be interesting. There is, in fact, an old upright in the flat that I’ve arranged to rent (I should be moving in tomorrow, but one never really knows until it happens…), so that might be a fun project. A friendly security guard. I got lost walking around Saburtalo (was it Sunday? ), and stopped to ask directions. The guard I had asked, clutching a Kalashnikov strapped around his shoulder, smiled and shrugged, and called this fellow. His English was quite good, and, as several other people have done, insisted on accompanying me to where I was going, drawing figures on my map in my guidebook and inscribing little explanations. His story was pretty interesting: a solid and extensive education, though because of the economic climate, he can’t seem to find a job to match his qualifications. After Saakashvili came to power things have been much better, he explained, but it’s still difficult to take care of his family. This seems relatively common among young people here; another young man, working at the estate agent’s through whom I visited a number of apartments, had spent ten years in Germany, had a master’s in International Politics and Economics, spoke excellent German, but couldn’t seem to find a job that would put his education to work, and funding for a PhD in Trier had also evaporated. That said, people tell me that since the Rose Revolution it’s extremely difficult for anyone over the age of forty to find any job whatsoever. A difficult transition period. Ok, I’ve just spent 15 minutes trying to insert this picture right-side-up, but WordPress refuses to cooperate…I’ve rotated it every which way in iPhoto, and tried again, but whenever I re-upload it to WordPress, it stubbornly insists on leaning to one side. And WordPress doesn’t have a rotate feature…Sigh. You’ll have to turn your computer, or let your head rest on your shoulder as you look at it. 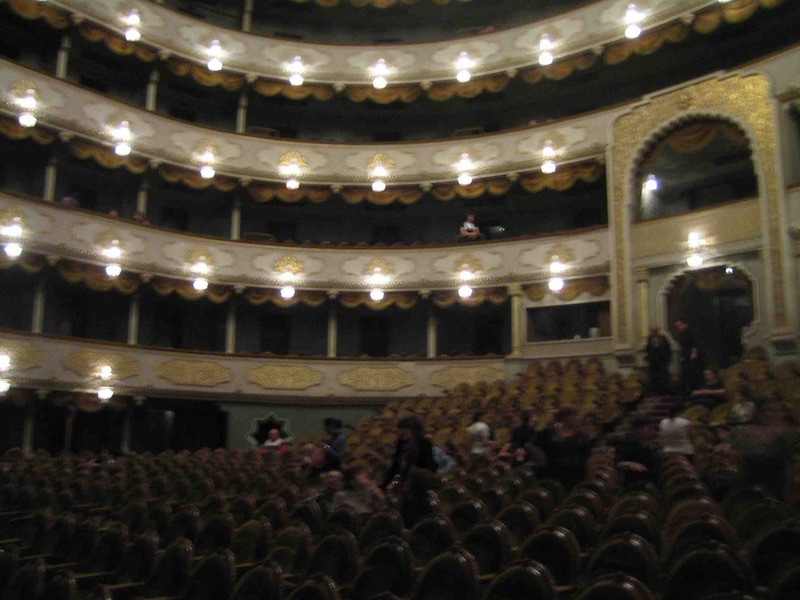 Anyway, on wednesday I went to the opera house for a concert, the third in this year’s Autumn Tbilisi festival. quite interesting. it’s quite an attractive building from the outside, quite markedly central-asian in character, almost moorish. The inside is rather dark, and rather antiquated, but pretty all the same. 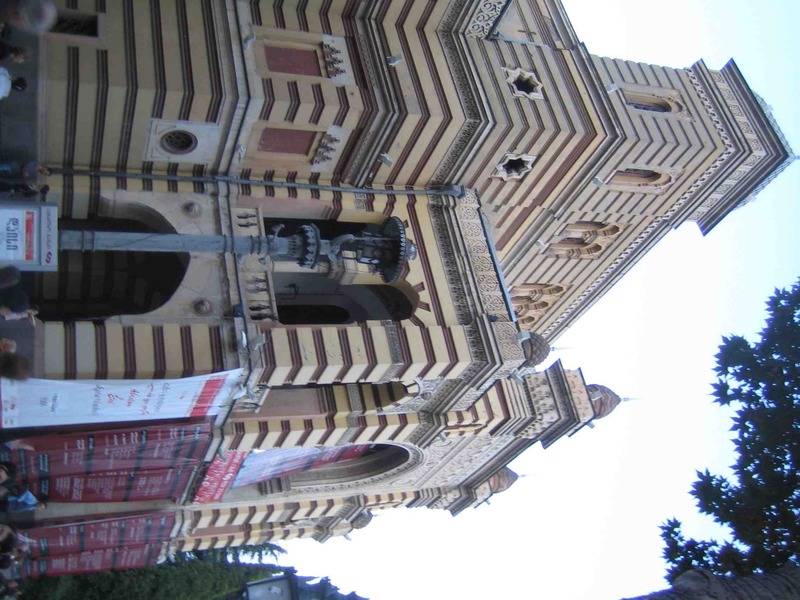 The Azeri pianist who was billed to play the Rachmaninov 2nd cancelled– though no notice was given to the audience–and was replaced by Tbilisi native Ani Takhidze, who played the Beethoven 4th. 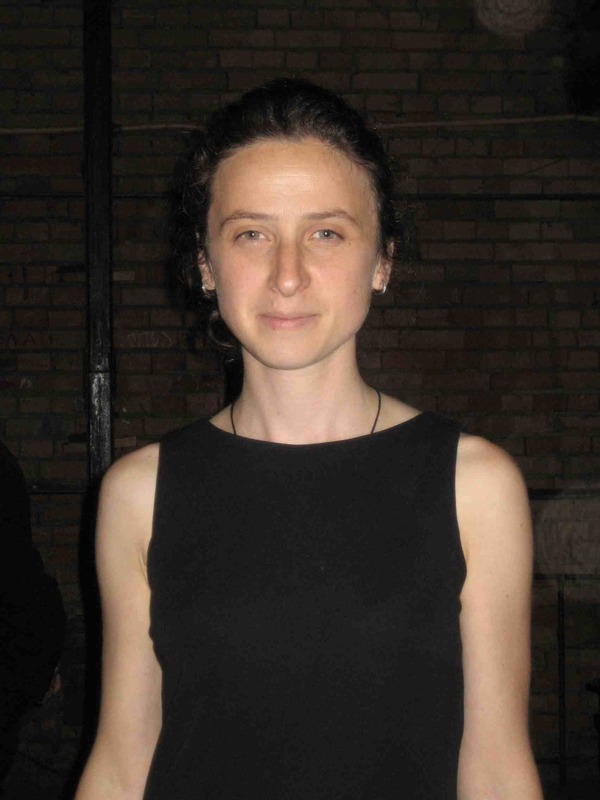 She was excellent; a mix of restrained intensity and gracefulness, her playing was dynamic, lyrical, limpid. The conductor, the formidable-looking Vakhtang Kakhidze, took things rather slow; slow and heavy and rather ponderous. the outside movements in particular need the occasional infusion of brio, of panache, of delight, and he kept things rather dour and solemn. the opening of the andante, always sinister, shuddered along in a sort of grim danse funèbre, the solemnity and oppressive gravitas persisting throughout the evening. Bruckner without the humour or lightness of touch. Same story with the Mussorgsky Pictures at an Exhibition which followed. Anyway, that’s all I have energy for today. A great Pleasure reading your blog! always interesting to see your homeland through foreigner’s eyes!